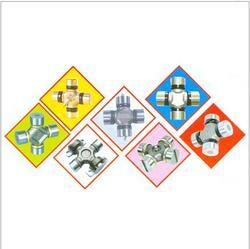 Being a prominent firm, we are engaged in delivering an extensive series of UJ Crosses. This item is made of as per standard quality of the market. Prior to its delivery, the offered item is verified thoroughly to make sure of its flawlessness. It is highly appreciated owing to its fine finish and smooth texture. Backed by a sound manufacturing facility, we are capable to manufacture an exceptional U J Crosses. These systems are fabricated in compliance with international quality standards and client's requirements as well. Our U J Crosses known for their rigid construction, high performance, long service life and easy handling. U.J. cross & bearings cups are manufactured using case carburising alloy steel. Having precision dimensions, these U.J. cross & bearings cups are designed to provide long service life even in highly demanding applications. As an affluent entity of this domain, we are affianced in providing premium quality array ofPick Up Cylinder Drum Cross Assembly. Supported by well-informed experts, we are providing an extensive series of UJ Cross. Our presented product is available in varied specifications to match with the client’s demand. We offer Track Combine Harvester Universal Joint Cross that is fabricated from superior quality raw materials and latest technologies. The Universal Joint Cross offered by us is widely demanded by the clients and can be availed at the leading industrial prices.